1. The library is the most solid and enduring item in the whole apparatus of intellectual life. In time our academic fads and fashions, our schools of thought and indeed entire disciplines, will pass soundlessly into the abyss of history. But the library endures – in fact it grows only stronger, driving its roots down ever deeper while the wreckage of history piles up around it. The library’s sheer material presence testifies to its ontological priority in intellectual life: ideas are fickle and intangible, they occupy no fixed location, but the library fills space and time with an imposing materiality. It is the mind’s anchor holding fast beneath the storms and currents of time. 2. When you think of librarians, you may imagine those bespectacled mild-mannered characters with their index cards and carbon paper and obsolete black-and-green computer screens. Librarians often contrive for themselves this Luddite image. But they are in truth the most progressive and visionary figures in the whole university: like bloodhounds, always hot on the trail of the future. Their demure appearance is a cunning disguise which allows them to perpetrate their radicalism all the more effectively. It is a camouflage net thrown over an armoured vehicle. 3. Just look at the Google Books project, engineered by Google but executed by an army of visionary librarians. These people could be running the world if they wanted to – and if they did not have to be home by 7 to feed the cat. 4. At the same time, there is nobody more conservative than a librarian. Their enthusiasm for constant change and reinvention springs from an even deeper commitment to what has been received from the hand of the past. The library is an angel whose wings are spread out in fierce and loving protection of the past, while its face stares deep into the eerie light of the future. 5. In all the world there is nothing more dangerous than a library. 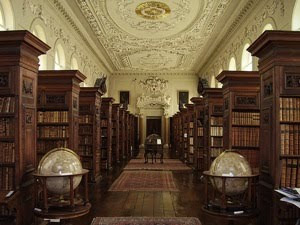 Within any library are the seeds for the overthrow of the world. What bloody revolution cannot be traced back finally to a library? Or to some book that lay waiting through silent centuries for the day when it would be unsheathed? The rule of silence – upheld in all libraries since time immemorial – is a ruse. It is the silence of a tiger crouching in the reeds. 6. More than any other institution – certainly more than the state or the judiciary – the library proves that meticulous structure and organisation are not obstacles to revolution but its embodiment, the muscles and sinews by which history stretches its limbs. 7. The library is also the safest and friendliest place on earth. More than that: the library is the institutionalisation of intellectual friendship. Which of us, admiring a shelf laden with the thoughts of dead authors, has never felt that these books love one another, even as they love to dispute and declaim? When I was a boy, I played hide-and-seek with my brothers among the stacks, while my mother slaved over her PhD. If history is a tangle of weeds and briers, the library is that commodious garden in which children play and every flower blooms. 8. Library catalogues have their instrumental necessity, but they should be consulted only as rough signposts. Your real goal is to cultivate the art of getting lost in libraries, just as you might deliberately lose yourself in the backstreets of a foreign city. “Like a true maze, the library [leads] the reader to his goal by leading him astray” (Giorgio Agamben). 9. Nowhere is architecture more important than in libraries. The physical space is to books as oak is to wine: no mere storage facility, but a medium that interacts, by a powerful alchemy, with what it contains. 10. Every head librarian is (or ought to be) vested with virtually unlimited executive powers. The library is one of those institutions in which benevolent dictatorship is not only desirable but essential. The head librarian is the captain of a ship at sea: her word alone is law. The importance of these executive powers lies in the fact that the librarian is answerable only to the collection, just as the pope is answerable only to God and a ship’s captain only to the devil. 12. I know a woman who worked as a librarian back in the 1960s, when the novels of D. H. Lawrence were still banned in Australia. The library’s Lawrence holdings were kept in a locked filing cabinet, and my friend – a young woman then – was responsible for the key. So one by one she secreted them away; during her lunch breaks you could find her smoking cigarettes and reading Lady Chatterley’s Lover beneath the shade of wattles and the hum of bees. 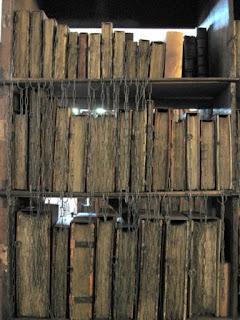 The moral of the story: the librarian is a sly animal; and if you're nice to them, you might one day get a glimpse of those treasures that lie hid in every library, away from dust and prying eyes, secured by lock and key.